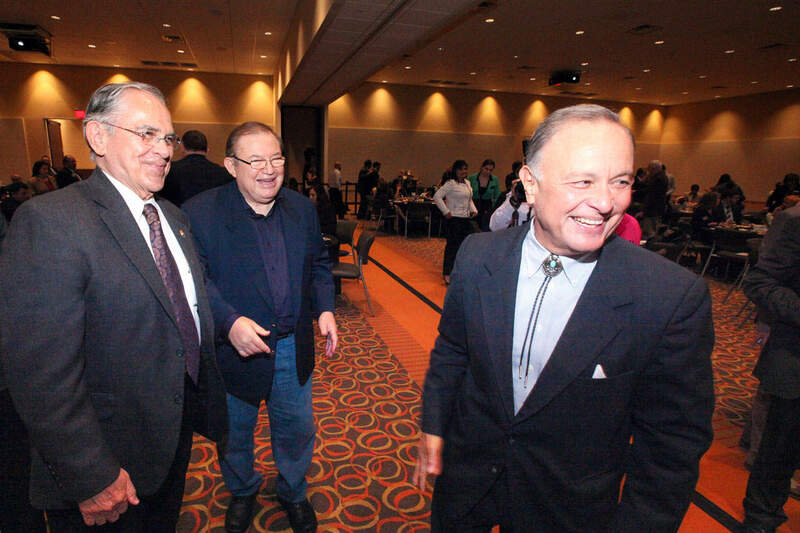 Featured, from left: Congressman Rubén Hinojosa, D-Mercedes; Hidalgo County Judge Ramón García; and Texas Secretary of State Carlos Cascos, on Thursday, January 21, 2016, at the Edinburg Conference Center at Renaissance. A proposal by Rep. Sergio Muñoz, Jr., D-Mission, which would allow a statewide vote to require that half of all future gubernatorial appointments go to qualified women, has been delivered to Gov. Greg Abbott by Texas Secretary of State Carlos Cascos. Under the Muñoz measure, Texas voters in a statewide election would have the power to create a law that women receive half of all gubernatorial appointments to powerful state boards, commissions, and agencies, such as the Texas Transportation Commission and The University of Texas System Board of Regents. During a four-year term, a governor will make about 3,000 appointments, according to the governor’s office. Muñoz would file the proposal when the Texas Legislature begins its regular session in January 2017. If approved by lawmakers, state voters could see it on the ballot as soon as November 2017. There are more than 200 state boards, commissions and agencies whose members are appointed by the governor, with the consent of the Senate. “Under this proposal, if approved by the Legislature and Texas voters, every time vacancies occur in each state board, commission and agency which requires a gubernatorial appointee, the first vacancy shall be filled by a qualified woman, the next vacancy shall be filled by a qualified man, and so on,” Muñoz said. “This method will guarantee that women will receive their fair share of the most powerful gubernatorial appointments.” Cascos, who was in Edinburg on Thursday, January 21, 2016, was provided with a copy of the Muñoz plan, and the Secretary of State, who was formerly county judge of Cameron County, agreed to present it to Abbott. Cascos was the first gubernatorial appointment announced by Abbott in November 2014. The Texas Senate confirmed Cascos as the 110th Secretary of State on Wednesday, February 18, 2015. In agreeing to take Muñoz’ plan to Abbott, Cascos shared his own commitment to increasing the roles and number of women in leadership roles in Texas. “I think it’s important to have a diverse representation of qualified women and men of different origins,” Cascos said. “I don’t think there is anyone who does not welcome diversity: male, female, Hispanic, African American, Asian American. Diversity is good.” The Secretary of State, who serves as the chief elections officer for Texas, reflected on the importance of Muñoz’ plan. “I think it’s something that’s noteworthy. There are a lot of groups that are not that well -represented,” Cascos said. “In my office alone, we have African American, Hispanics and Anglos. So my office, since I have been in there, has become more diverse than what it was before I got there.” Muñoz said the time has come for Texas to build on its international reputation as a leader for all people. “I believe Texas is ready to take this remarkable step forward in democracy, and in doing so, show the world what we are doing to make sure that women are equal to men in legal, political and social rights,” said Muñoz. Women are underrepresented on most state boards and commissions which require gubernatorial appointees, and many of the state agencies they help lead have annual operating budgets of hundreds of millions of dollars, up to $10 billion and even higher. Abbott, a Republican, has the opportunity to demonstrate his support for women by endorsing Muñoz’ plan, which would most affect one of a governor’s most significant legislative powers. “I encourage Gov. Abbott to support my plan because it affects his office specifically, but more important, it is the right thing to do,” said the House District 36 lawmaker. Abbott recalled that on Election Night in November 2014, Abbott said “I made a promise to the people of Texas that I would begin work immediately to keep Texas the beacon of opportunity and the best state in the United States of America.” The governor pledged that he “would fight for all Texans, I would unite our great state with key appointments that reflect both the geography and the diversity of our great state. Texans from every corner of the state need to feel that they are a part of the state’s leadership, that they are coauthors of our future.” Muñoz said the idea was brought to him by David A. Díaz, a legislative consultant from McAllen. Díaz and Miriam Martínez had worked together on the issue when Martínez, a South Texas broadcast journalist and business owner, ran for Texas governor, seeking the 2014 Republican Party nomination, which was won by Abbott. Martínez said if elected governor, her gubernatorial appointments would be been divided evenly between women and men, and she would have asked for a statewide vote to make that practice a permanent requirement. “My duties as a state lawmaker include searching out and recognizing bold ideas from the people of Texas, and helping transform their vision into the laws of the land,” said Muñoz. “I happen to also agree with the famous remarks by Sen. Robert Kennedy: “‘Some people see things as they are and say why? I dream things that never were and say, why not?’ This is my inspiration for all legislation.” Kennedy’s timeless comments came on March 18, 1968 during his speech at the University of Kansas. Kennedy credited George Bernard Shaw, an Irish playwright who won the Nobel Prize in Literature in 1925, for the quote. Muñoz said his proposal is not a quota, which favors one group at the expense of another. “Under this plan, a majority, in this case, men, would not lose out to a minority – women – because the population of Texas is, and most likely will always be, about half men and half women,” Muñoz said. “Any Texas governor would find no problem whatsoever finding women who are very qualified for half of all gubernatorial appointments.” The UT System Board of Regents, which is currently operating under a $16.9 billion budget for Fiscal Year 2016, has two women and seven men on that governing board. The Texas A&M System Board of Regents, which is currently operating under a $4.2 billion budget for Fiscal year 2016, has two women and seven men on that governing board. The Texas Ethics Commission, which is responsible for administering and enforcing laws that require financial disclosures of state lawmakers and legislative employees, has one woman on its eight-member commission. The Texas Department of Transportation, which has a $23 billion two-year budget, is governed by the five-member – and all male – Texas Highway Commission. Only three women have been appointed to this powerful commission since 1993. The Texas Parks and Wildlife Commission, a seven-member board which oversees the Texas Parks and Wildlife Department and its 2016-17 $719 million budget, is comprised of all men. The three-term lawmaker, who serves on the powerful House Appropriations Committee, which shapes the state’s $209 billion, two-year budget, said his proposal is consistent with his professional and legislative work. “I am a champion for women, who make up half of our adult population, with a proven record of promoting equal pay for equal work, and through my leadership roles on the House Appropriations Committee, supported and voted for hundreds of millions of dollars for women’s health care, protecting victims of family violence, and much more,” said Muñoz. A proposal by Rep. Sergio Muñoz, Jr., D-Mission, which would allow a statewide vote to require that half of all future gubernatorial appointments go to qualified women, has been delivered to Gov. Greg Abbott by Texas Secretary of State Carlos Cascos. Under the Muñoz measure, Texas voters in a statewide election would have the power to create a law that women receive half of all gubernatorial appointments to powerful state boards, commissions, and agencies, such as the Texas Transportation Commission and The University of Texas System Board of Regents. During a four-year term, a governor will make about 3,000 appointments, according to the governor’s office. Muñoz would file the proposal when the Texas Legislature begins its regular session in January 2017. If approved by lawmakers, state voters could see it on the ballot as soon as November 2017. There are more than 200 state boards, commissions and agencies whose members are appointed by the governor, with the consent of the Senate. Cascos, who was in Edinburg on Thursday, January 21, 2016, was provided with a copy of the Muñoz plan, and the Secretary of State, who was formerly county judge of Cameron County, agreed to present it to Abbott. Cascos was the first gubernatorial appointment announced by Abbott in November 2014. The Texas Senate confirmed Cascos as the 110th Secretary of State on Wednesday, February 18, 2015. In agreeing to take Muñoz’ plan to Abbott, Cascos shared his own commitment to increasing the roles and number of women in leadership roles in Texas. The Secretary of State, who serves as the chief elections officer for Texas, reflected on the importance of Muñoz’ plan. Muñoz said the time has come for Texas to build on its international reputation as a leader for all people. “I believe Texas is ready to take this remarkable step forward in democracy, and in doing so, show the world what we are doing to make sure that women are equal to men in legal, political and social rights,” said Muñoz. Women are underrepresented on most state boards and commissions which require gubernatorial appointees, and many of the state agencies they help lead have annual operating budgets of hundreds of millions of dollars, up to $10 billion and even higher. Abbott, a Republican, has the opportunity to demonstrate his support for women by endorsing Muñoz’ plan, which would most affect one of a governor’s most significant legislative powers. “I encourage Gov. Abbott to support my plan because it affects his office specifically, but more important, it is the right thing to do,” said the House District 36 lawmaker. Muñoz said the idea was brought to him by David A. Díaz, a legislative consultant from McAllen. Díaz and Miriam Martínez had worked together on the issue when Martínez, a South Texas broadcast journalist and business owner, ran for Texas governor, seeking the 2014 Republican Party nomination, which was won by Abbott. Martínez said if elected governor, her gubernatorial appointments would be been divided evenly between women and men, and she would have asked for a statewide vote to make that practice a permanent requirement. Kennedy’s timeless comments came on March 18, 1968 during his speech at the University of Kansas. Kennedy credited George Bernard Shaw, an Irish playwright who won the Nobel Prize in Literature in 1925, for the quote. Muñoz said his proposal is not a quota, which favors one group at the expense of another. The UT System Board of Regents, which is currently operating under a $16.9 billion budget for Fiscal Year 2016, has two women and seven men on that governing board. The Texas A&M System Board of Regents, which is currently operating under a $4.2 billion budget for Fiscal year 2016, has two women and seven men on that governing board. The Texas Ethics Commission, which is responsible for administering and enforcing laws that require financial disclosures of state lawmakers and legislative employees, has one woman on its eight-member commission. The Texas Department of Transportation, which has a $23 billion two-year budget, is governed by the five-member – and all male – Texas Highway Commission. Only three women have been appointed to this powerful commission since 1993. The Texas Parks and Wildlife Commission, a seven-member board which oversees the Texas Parks and Wildlife Department and its 2016-17 $719 million budget, is comprised of all men. The three-term lawmaker, who serves on the powerful House Appropriations Committee, which shapes the state’s $209 billion, two-year budget, said his proposal is consistent with his professional and legislative work. “I am a champion for women, who make up half of our adult population, with a proven record of promoting equal pay for equal work, and through my leadership roles on the House Appropriations Committee, supported and voted for hundreds of millions of dollars for women’s health care, protecting victims of family violence, and much more,” said Muñoz. According to the independent online publication, The Texas Tribune, “the House version of the 2014-15 budget included an additional $100 million for women’s health funded via a bolstered primary care system — dollars that first made it through the Senate, and should allow the state to serve an additional 170,000 low-income women. The authority to make governmental appointments is one of the powers given to the Governor of Texas by the state’s constitution. In 1972, Texas voters had a direct voice on the office of the governor, voting in a statewide election to extend the two-year term, which had first been established by the Texas Constitution of 1876, to the current four-year term, according to the Texas State Historical Association (https://tshaonline.org/handbook/online/articles/mbgos). The current four-year term of the governor took effect in 1975, according to TSHA. • State elected and judicial offices when vacancies occur by resignation or death of the office holder. Article IV, Section 12 of the Texas Constitution, provides the governor with the power to appoint individuals to the governing boards of more than 200 state boards, commissions, and agencies. Those appointments must receive the approval and consent of the Texas Senate. Since the appointment power of the governor is provided the the state constitution, it would require the Texas Legislature, when lawmakers return in January 2017 for its five-month regular session, to approve Muñoz’ plan, which would authorize a state constitutional amendment to be decided by voters in a statewide election. Muñoz’ proposed constitutional amendment and resulting election would have to be approved by two-thirds of the members of the Texas House of Representatives and the Texas Senate. Then, more than 50 percent of the vote by the public in a statewide election would be needed to make it law. This is a list of all entities to which the Governor makes appointments or nominations. More detailed information on each entity is available via the Texas Records and Information Locator (TRAIL). TRAIL provides links to most agencies’ background information, web pages, and the text of statutes. Click here for an alphabetical list of all entities. Applicants may apply for any entity on either list. According to Abbott’s office, below is a list categorized by subject matter relating to the board, commissions and agencies which involve gubernatorial appointments. Rep. Sergio Muñoz, Jr., D-Mission, has served in the Texas Legislature since 2011 and represents all or parts of the cities of Hidalgo, Granjeño, McAllen, Mission, Palmview and Pharr. His Capitol office is located at E1.508 in the Capitol extension, and may be reached at (512) 463-0704. His District Office is located at 121 E. Tom Landry, Mission, and may be reached at (956) 584-8999.